PRESENT POSITION:: Mrs. Patricia A. Thomson Graham is a Certified General Real Estate Appraiser and Senior Valuation Consultant with the Long Beach, California office of Klaris, Thomson & Schroeder, Inc.
Mrs. Thomson Graham began her association with Klaris, Thomson & Schroeder, Inc. in 2005. She has prepared appraisals of residential, industrial and commercial real estate for estate tax, litigation support, estate planning, insurance, and sale/purchase. She specializes in the valuation of real property including commercial, and industrial involving fee simple, leased fee, and leasehold interests valuations. She has attended numerous appraisal seminars and annual appraisal conventions. EDUCATION:Mrs. Thomson Graham received her Certified General Real Estate Appraiser license in 2017. In addition, she received her Master’s in Organizational Management in 2002 from the University of Phoenix and her Bachelors of Arts in Business Administration in 1996 from Mount St. Mary’s University in Brentwood, California. In 1992, Mrs. Thomson Graham received her Real Estate License in 1992 from Lumbleau Real Estate School in Orange County. 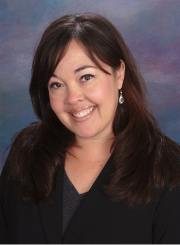 She currently manages the day-to-day operations in the LA office and is working on joining the ASA and receiving a MAI through the Appraisal Institute.